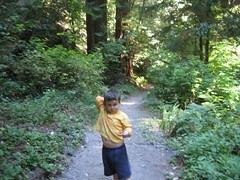 Little Butano Creek Trail, in Butano State Park, is an ideal hike for kids with autism or adhd, and toddlers. It is a 1.5 mile (3 miles return), easily followed trail with plenty for kids to look at (banana slugs, caves, shallow creeks, bridges, boardwalks). It is mostly flat, shady, and surrounded by my favorite kind of Redwood splendor. Leelo and Iz didn't complain or dally at all, and even 21-month old Mali did most of the hike. We hiked Butano on Labor Day. It was the first totally free, and successful, family time we'd had in just about forever, as Leelo's schedule fractures every single one of our regular days. I am not complaining, because we so very appreciate his team's support--but we used to be spontaneous people, and it was nice to feel like a regular family. We had a fantastic time, kids included.